Former foreign secretary William Hague has urged voters not to make their EU referendum decision on the basis of controlling immigration. 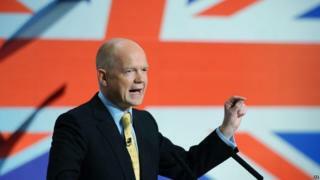 Lord Hague said economic growth and Western unity were factors that made it "undoubtedly" better to remain in. The ex-Tory leader said he was an "outright Eurosceptic" but suggested staying in was "the lesser of evils". Vote Leave said its proposals would reduce immigration and accused the Remain campaign of "scaremongering". Speaking on BBC Radio 4's Today programme ahead of a speech later, Lord Hague said he remained a critic of the EU but said that it had changed in recent years, and called for a "clear-headed" decision on 23 June. "We are in an imperfect world," he said, "many of the choices we make in life are between the lesser of evils". The Leave side has been campaigning hard on immigration, saying it cannot be controlled from within the EU. Lord Hague said "leaving the EU as a means of controlling immigration" would affect British people wanting to move and work elsewhere in Europe. "This is not the issue on which to decide how to vote in this referendum," he said. Lord Hague also said Turkish accession to the EU should not be the key factor in making people's minds up, because it is "not on the cards", and warned of a "danger of the fragmentation of the Western world" if the UK leaves. Leave campaigners have highlighted the government's backing for Turkish membership of the EU, saying a million Turks could potentially come to the UK within eight years of joining. In his speech later, the Tory peer will accuse the Leave campaign of peddling a "total fantasy" about what life would be like for the UK outside the EU. Irrespective of the level of tariffs that UK firms might face outside the EU, he will say confidence in the future of the British economy would be "seriously undermined", other countries will seek to lure businesses headquartered in the UK and the UK would be in a weak negotiating position to because of rules requiring exit talks to be concluded within two years unless all 27 states agree to extend them. Lord Hague, who as Tory leader fought the 2001 election campaign on a platform of keeping the UK out of the euro, will argue his four years as foreign secretary has not sapped his Euroscepticism or his opposition to the UK's involvement in monetary union or a European army. But he will argue that EU membership confers clear economic and diplomatic benefits on the UK. "I've spent my political life standing up to it," he will say. "But for all its imperfections, it protects jobs and boosts our standing and power in the world. Let me tell you straight, as someone who's an outright Eurosceptic, leaving the European Union would be downright irresponsible. "The idea that we can leave the EU without any serious economic consequences for jobs and businesses in Britain, and somehow have more money to spend on the NHS and other services at the same time, is a total fantasy, and people need to know that before they vote." But UKIP MP Douglas Carswell said the UK would not face trade tariffs if it left the EU. "At Vote Leave we do not believe that we would face restrictions on trade given that we are Germany's single largest export market," he told Today. Leave campaigners hit back at Lord Hague, with Conservative MEP David Campbell Bannerman saying on Twitter that it was "pathetic" asking voters to "put up with more European fudge" and not to mention immigration. Immigration was a major theme in Tuesday night's live Q&A featuring David Cameron and Nigel Farage, where the PM was repeatedly criticised for failing to control the numbers coming to the UK. Vote Leave has advocated a points-based system similar to that used in Australia, saying this would be fairer on people coming from outside the EU and give the UK control over its borders.